I am really not convinced the shorting as the shorted price turned out to be the lowest of the day at the close. I should have just short it earlier. I am watching very closely with the stop loss level of 2565 from now. The trend is obvious down but there will be bound from time to time. Higher to further sell is my way. 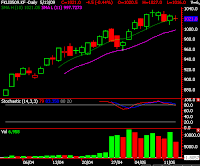 Stop Loss Moved down to 2518 which is 10 points above the moving average high (2508). I am using 4 hourly chart shown above. I closed my position at the open given the reason of the crude oil futures broke new recent high last night. The profit is small but at least positive. Markets over all looks strong or at least consolidation. 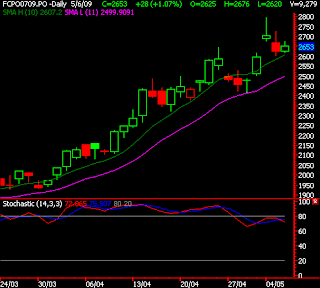 CPO Futures will rebound here a bit and I am ready to short when opportunity comes. Date: 20090521 It looks like this is time time to be ready to short the market based on the close of CPO August 2009 Future Contract which closed at 2499 broken the low of 2513 registered on 18 May 2009 (reason 1). 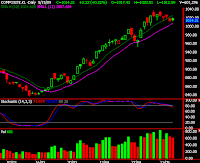 The daily stochastic has been down (reason 2). My strategy: I will wait for a rebound if possible touches the lower line of moving average (purple line) and place my short order. In trading, we really have no idea what the real direction of the market will be. It will be very wrong to use our opinion to trade the market. Everything might seem turning bearish but it usually is not true. Remember: let the markets tell us what to do. I do not have a strong reason to close my position actually as the daily stochastic and even stochastic of 15 minute chart are still bullish. Further more, the price broke yesterday high. I close it for reason of confirming my profit. 1) All the markets including stocks and shares, currencies and index futures are pointing up. Since I am in short term - intraday, I just closed my short position and I loss RM575 including charges.